My first reaction to this is: eh, why? Anarchs have the best fracter in the game in-faction: Paperclip and it's not due to rotate for quite a while. Due to how Yusuf first requires charging by making runs and then allows you to break ice without paying money it seems designed like a secondary breaker. However it's 2. That level of memory hungriness is typically reserved for extremely efficient breakers that rarely see use in practice and very efficient economy cards like Magnum Opus. Ok, I guess I should review this under the assumption that Yusuf is installed on Progenitor or with MemStrips to give it a fair review. The thing is though, if you're going to do that you need a Progenitor just for Yusuf. Pulling off a combo just to get a secondary breaker feels inefficient, to say the least. MemStrips is a bit better though you'd better have a use for that remaining 1 as well. 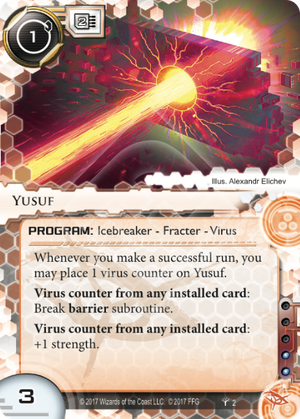 The only thing Yusuf does really well is generate virus counters. If there were a card that lets you use the virus counters on Yusuf for something else it could be a viable support tool. However I didn't find such a tool. Maybe one will be revealed later in the cycle but until that time I simply don't see Yusuf as a useful breaker.